Nashville, TN -- When we think of the finer things in life, we think of quality, and among the highest quality acoustic music being produced today is that of The Kruger Brothers. The Kruger Brothers are playing a show on June 18th in Denver at Daniels Hall (Swallow Hill Music) located at 71 East Yale Avenue, Denver, Colorado. Show starts at 8 PM. Tickets $20-27. Nashville, TN -- Known for inventive compositions and performances that defy categorization, The Kruger Brothers have announced tour dates for 2016. Since their formal introduction to American audiences in 1997, The Kruger Brothers' remarkable discipline, creativity, and ability to infuse classical music into folk music has resulted in a unique sound that has made them a respected fixture within the world of acoustic music. The honesty of their lyrics has become a hallmark of the trio's work. Nashville, TN (June 10, 2014) — World-renowned trio The Kruger Brothers will debut a new concerto, “Lucid Dreamer,” during the Wide Open Bluegrass festival in Raleigh, NC this fall. The new piece, commissioned by the Kontras Quartet through Chamber Music America, will be performed by the Kruger Brothers with the Kontras Quartet on Saturday, October 4, at 1:20 pm in the Raleigh Convention Center. Nashville, TN -- The Kruger Brothers will premiere Jens Kruger’s The Spirit of the Rockies August 25 at the Banff Centre in Banff, Alberta, Canada. The band, comprised of Jens Kruger, Uwe Kruger and Joel Landsburg, has become celebrated worldwide for its seamless fusions of jazz, classical, folk and bluegrass. This coming January 24th 2012 at 7:00pm The Kruger Brothers will be performing in concert at the Performing Arts Theater at Cuyamaca College, El Cajon. Greg Deering sayc, "For those of you who know the Kruger Brothers I don't have to tell you how good they are. You already know this is a must see event. The Kruger's do not play in California very often and there are only a limited number of tickets still available. They won't last long so be sure to get your tickets right away." 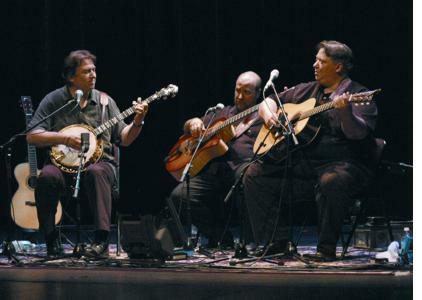 Deering Banjo Company is proud to present world renowned bluegrass band, The Kruger Brothers who will perform live at the Performing Arts Theater on the campus of Cuyamaca College, 900 Rancho San Diego Parkway, El Cajon, CA, 92019 on Tue. Jan 24, 2012 at 6:00p.m.